The Riverside County CSA Recreation Unit, aka MARS is dedicated to providing fun, spirited activities and events which enhance the quality of life for our CSA residents within Riverside County. Looking to meet new people within your community? Or just want to have great family fun? Come join one of our awesome community events throughout the year. Be on the lookout for new events, coming to a CSA park near you. Riv Co MARS stands for Riverside County Mobile Activities Recreation Services. It's what we call our recreation program. If you come to one of our events, you can see the colorful MARS Van on full display, loaded with goodies, games & supplies that make our events possible. We are mobile and ready to serve CSA communities within Riverside County. Follow us on Facebook or Twitter to see our coming events as well as recaps and photos of past events. CSA 134 & 143 residents, please join us for the upcoming Spring Festival 2019 events. Coming to a park near you in 2019. Below are times and locations for each event. For more information, contact rkross@rivco.org or 951.955.4816. Snow Day 2018 was a perfect winter wonderland of fun! 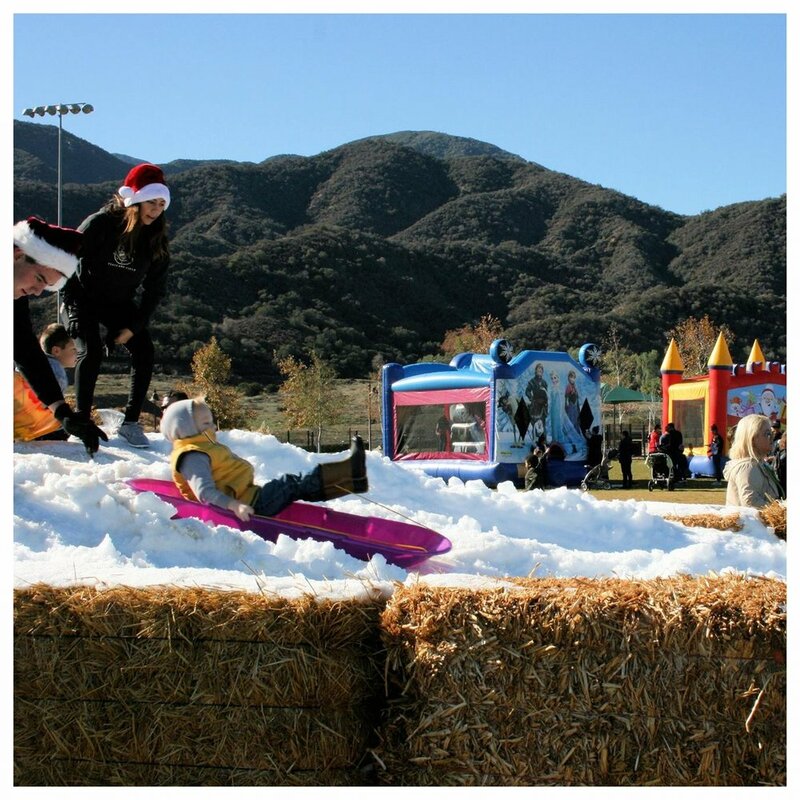 More than 1,000 attendees enjoyed over 40 tons of snow, sledding ramps, drinks and crafts at Deleo Park in Temescal Valley. The 2018 Fall Festival events took place at Deleo Park on October 20, 2018. This event featured a pumpkin patch, jumpers, interactives, super hero laser tag, dance party, costume contest, a haunted house and a spooky train ride. The 2018 Movies in the Park series featured two epic movies, Peter Rabbit & Disney’s COCO. Six total events took place at Willows Park in Murrieta, Deleo Park in Temescal Valley and Madigan Park in Temecula. Activities included: Bouncers, Reptile Exhibit, Crafts, Live Entertainment, Popcorn, Face Painting and much more! More than 1,500 CSA residents were in attendance and enjoying a night under the stars. Spring Festival at Galleron Park, Central Park and Deleo Park was a full fledged celebration of Spring! With and Egg Hunt, Games, Bouncers, Interactives, and the Easter Bunny. More than 2,000 residents were in attendance for all 3 events. Snow Day at Deleo Park took place on December 16, 2017. Residents were entertained by Santa, REAL SNOW, sledding ramps, a life sized snow globe, a snowboarding simulator and holiday crafts. More than 1,000 locals came out to enjoy the day!! The 2017 Fall Festival events took place at Deleo Park and Madigan Park last October. These events featured a pumpkin patch, jumpers, interactives, zorb ball races, mad science booth, the Maddening Maze and a spooky train ride. The 2017 Movie in the Park Series featured two exciting Disney movies, Moana and Finding Dory. The 2017 Summer Splash was a sun-filled day of water and family fun, held at Deleo Park in June 2017 . The entertainment included Water Balloon fights, Water Slides, Bubble Rollers, Glitter Tattoos and Carnival Games. The 2017 Spring Fest hopped its way to two of our local CSA parks. The Easter bunny made a special appearance along with, crafts, bouncers and of course several Easter Egg Hunts. Are you interested in being a vendor at one of our upcoming event? Fill out the form below. We will respond as soon as possible. Please describe what items you wish to sell. Are you in need of electricity or access to electricity? Let us know what event you would like to be a part of. Thank you for submitting out vendor interest form. We will get back to you as soon as possible!